I’ve started adding hemp seed oil to salads and smoothies to reap its benefits! Hemp seeds are rich in omega 3, omega 6, protein and vitamin E antioxidants. 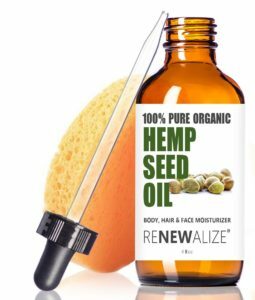 Hemp seed oil also contains linoleic acid and Vitamin E that helps slow down aging, add shine to your hair, and fight skin disease such as psoriasis. Here are the best hemp oil products that can help you get the most of this nature’s best stuff. Why I like it: Nutiva is a values-driven company that is a leader in the health food industry. Their high-standards in natural health is apparent from their organic farms that grow their produce to their sustainable manufacturing and transportation processes. Their USDA organic hemp oil is non-GMO and cold-pressed from raw shelled hempseed for maximum nutrition and a delicate nutty flavor. The company also sources their seeds exclusively from Canada and dates their product to ensure the freshest seeds possible. I like adding a few drops of this oil in my salad, pesto, and smoothies for maximum nutritional benefits. Users on Amazon also apply this oil on their faces and it cleared acne in a month! When you purchase Nutiva’s organic hemp oil, Nutiva will also donate 1% of sales to sustainable agriculture. It’s definitely worth giving Nutiva a shot! Why I like it: This hemp seed oil is 100% cold pressed and cold-filtered to keep it fresh and its nutrients intact. It is made without the use of additives, chemicals, and preservatives. I like that Just Hemp Foods processes their seeds in small batches and carefully selects them by color and flavor. You can add this to your food, or put a few drops on your skin and hair. It even effectively removes makeup, and some confessed that it made their lashes grow! 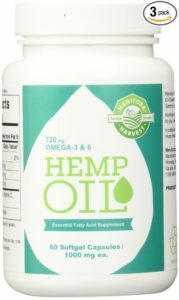 Why I like it: This is a great product for people who are still starting out with hemp oil. It provides the benefits of this natural healing oil without the hefty price tag. This 100% cold-pressed hemp seed oil is gluten-free and cholesterol-free. You can add it to your food, take it raw, or apply it directly on your skin. Users of this product said that it helps solve their problem with plantar fasciitis. Why I like it: If you don’t like the nutty flavor of raw hemp oil, then you could still get the benefits of hemp oil for hair and skin through these capsules. Because they are in capsule form, they also don’t need to be refrigerated and are best when you are traveling. I also like that Manitoba Harvest uses hemp seeds that are grown sustainably without pesticides and herbicides for this product. They are also non-GMO Verified. Why I like it: This hemp seed oil moisturizer is specifically created for topical use on oily and acne-prone skin. It’s a great daily moisturizer and will not clog pores. It is 100% pure cold-pressed and unrefined oil made from the seed of industrialized hemp. You can use this as oil balancing moisturizer and makeup remover. If you are doing the oil-cleansing method, this is a great alternative for coconut oil. Renewalize also offers a 1-year risk-free money-back guarantee for this product. Suffering from dull hair and problematic skin? Check out the benefits of hemp oil for skin and hair.